Kydex is a high-quality thermoplastic material used for manufacturing a wide variety of products — including holsters and magazine carriers. Kydex is waterproof, which prevents the retention of moisture that can lead to premature rotting. 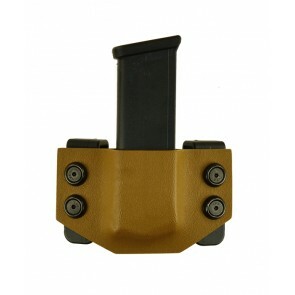 Kydex also produces lower friction when placing and removing the weapon in the holster. What's more, Kydex will not stretch or shrink and retains its shape well, while also exhibiting exceptional scratch-resistant properties. Here at High Noon Holsters, we rely on Kydex to manufacture many of our products, including the carriers that so many of our loyal customers depend on to store their magazines on their Rock Steady and Tactical belts. We recognize the long-term value that this unique material delivers to new and experienced users of various types of concealed carry weapons. Our assortment of Kydex magazine carriers includes inside-the-waistband and outside-the waistband offerings for light, medium and extreme duty magazine applications. You can customize the look and performance of your carrier in various ways. Start by selecting your preferred color — our attractive options include black, coyote brown or OD green. We also offer carriers compatible with the most popular magazine models from top manufacturers such as Browning, Ruger, Smith & Wesson and Glock, to name just a few. Choose Kydex mag carriers tailored to both left-handed and right-handed reloading functions. No matter which Kydex magazine carrier best meets your needs, you can always expect a durable, cutting-edge, expertly crafted product from High Noon Holsters. Over the course of more than 20 years in business, our unwavering commitment to quality and customer service has helped us build a large and loyal customer base. Both new and long-term owners and users of concealed carry weapons make us their one-stop source for magazines, holsters, belts, accessories and more. If you're tired of having to navigate cluttered websites that waste your time and don't always deliver what they promise, you'll love our newly redesigned e-commerce site because you'll be able to find what you need quickly. Once you've made your decision, add the items to your wish list and complete the simple, secure checkout process. You'll also appreciate our abundance of payment options, including PayPal, Visa, MasterCard, Discover, and American Express. In most cases, we can ship any in-stock item within one and five days. We invite you to take a minute to explore our wide assortment of mag carriers. If you can't find what you need or have questions, please give us a call or send us an email, and we'll be happy to help. 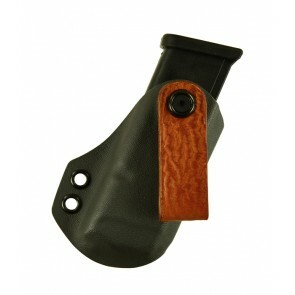 Make High Noon Holsters your single source for all your concealed carry product needs!